Today we were back to normal. It has cooled down a lot. From 28 degrees to something between 16-18 when we first went out. Then the rain came and we were lucky that we had already reached the market hall and went for a coffee. After the rain had stopped we did our usual round over the local flea market before we went back home to get changed. Jeans for the first time since we arrived and a jacket. We then took the bikes and cycled to Friedrichshain to walk over their weekly farmers market. 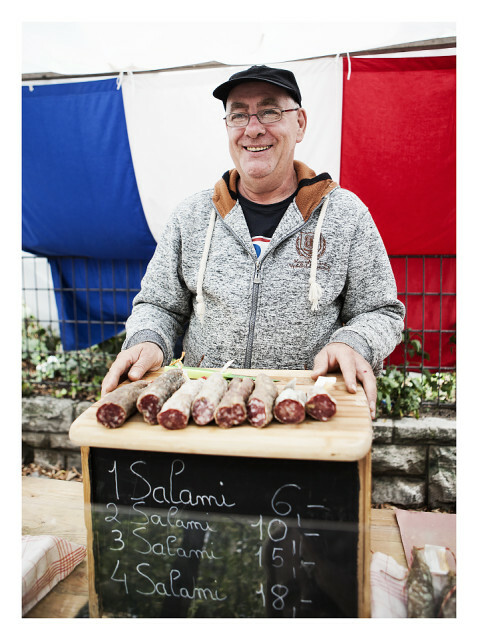 It was a lovely market and I was delighted to find a French Salami stall. I DO love French saucisson! After the market we cycled to Treptow and went to one of my favourite places, White Trash Fast Food, for another coffee. We then cycled home, visited Anke a again and I bought a pair of shoes despite no intentions. But they are cool and were cheap! We went out in the evening and are just back. My Blip is my Salami-French-Man. He was such a happy and lovely guy.